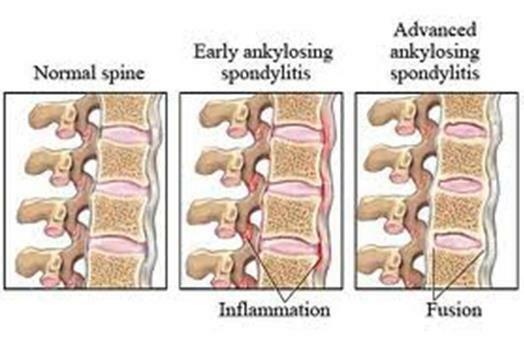 Ankylosing Spondylitis is a systemic spondyloarthropathy, more common in males than in females. In the acute phase, the condition is characterized by widespread spinal joint inflammation, but severe cases can progress to eventual fusion of the spine. The patient may present as a late teen or early twenties male complaining of shoulder and pelvic girdle pain with no specific history of trauma. Night pain is often significant and the symptoms display inflammatory type characteristics such as morning joint stiffness. The signs and symptoms tend to settle well with manual therapy but the improvements are only short term. Failure of the signs and symptoms to resolve with appropriate treatment will alert the physiotherapist to the possibility of an underlying systemic condition and the patient will be referred to their doctor for blood tests. Current medical management is controlled by rheumatologists who are able to prescribe drugs that significantly reduce the signs and symptoms of Ankylosing Spondylitis in a high percentage of patients. Referral by your GP to a Rheumatologist for assessment and medical management is highly recommended. Physiotherapists at the Shenton Park Annex of Royal Perth Hospital many years ago implemented a rehabilitation program for patients suffering from severe Ankylosing Spondylitis. The first cohort had an excellent outcome and the program encouraged self-management of mobility, fitness and general health. The program has been highly successful and has been implemented worldwide. Physiotherapy management involves exercises to improve aerobic fitness, strengthening and stretching programs, and spinal mobility exercises. Similar strategies can also be implemented in the treatment of other inflammatory systemic conditions such as fibromyalgia and chronic fatigue syndrome. The physiotherapy treatment is not a cure for the condition, but rather a method by which the patient can become more functional and take a greater role in the control of their symptoms.